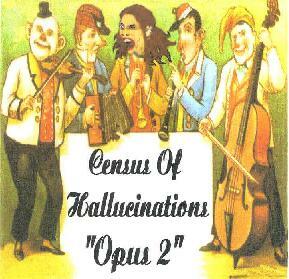 Census Of Hallucinations - "Opus 2"
Census Of Hallucinations' sophomore release comes hot on the trail of its debut. Opus 2 differs from the first Census Of Hallucination album in that it's more of a continuous work that must be experienced as a whole. No single tracks really grabbed me like some from the first disc did. But once I gave it the headphones treatment it became clear that many magical pieces threaded together make this a fuller and more linear work than the first disc was. The Stone Premonitions folks are wizards in the studio and, without getting carried away with efx, manage to infuse their songs with fun sounds, creative editing, and overall solid production. The music on Opus 2 has a powerful drifting quality. Much of it is like light progressive rock but its ethereal nature gives it a psychedelic edge. The keyboards glide smoothly in the background as the guitar jams along. Tim Jones is a great guitarist but you have to listen closely to pick out all the impressive playing scattered throughout this album. And the vocals, of course, are gorgeous. Tim and Terri as individuals are wonderful singers, but as a pair they're hypnotic. One of the things that make Stone Premonitions projects with Tim and Terri at the center so magical is their ability to make the "song" the center of their musical palette, while painting the universe around it with music that is spiritually uplifting and truly mind expanding. It's hard for me to get away from the individual tracks on the first Census album that I liked so much. But when I'm in the mood to relax and absorb, then I think Opus 2 would be the more appropriate tonic.